We introduced the HMF Can initiative last year, asking you - runners, volunteers and spectators - to bring nonperishable foods to race events. You delivered. Thank you! With your help, we surpassed the goal of collecting 10,000 pounds of food, and are excited to up the ante to 12,000 pounds in 2016! Please see the release below to learn more about this most important race of all, the race against hunger. 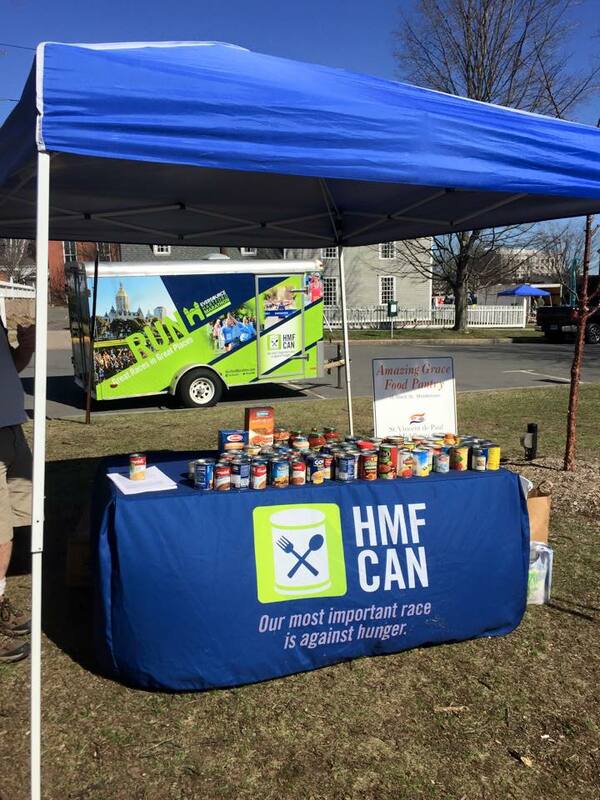 The nonprofit Hartford Marathon Foundation (HMF) is asking runners to help collect 12,000 pounds of non-perishable foods at HMF race events this year. 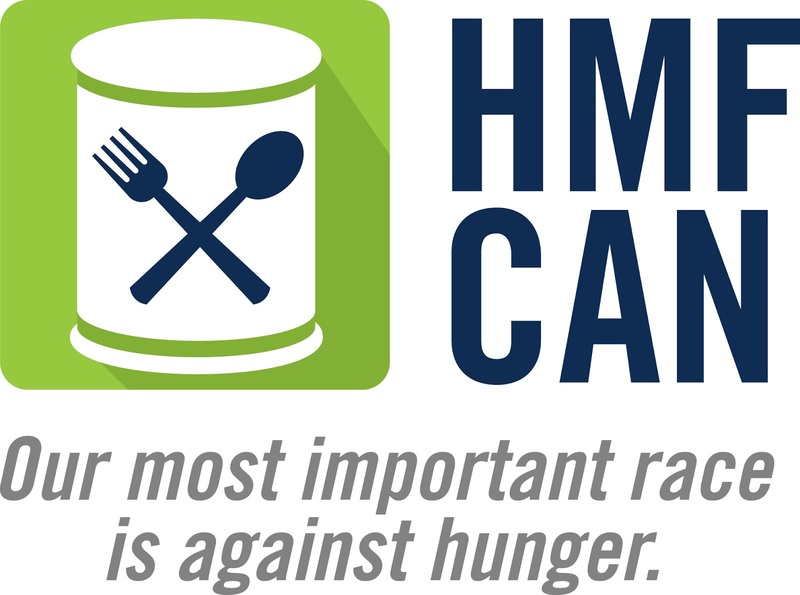 Introduced in 2015, the “HMF Can” initiative encourages runners to bring donations on race day to be provided to food banks within the communities that race events are held. More than 10,000 pounds of food was donated in 2015 through HMF Can donations. Last year, 900 pounds was gathered at the Harvard Pilgrim Middletown Half Marathon to benefit the Amazing Grace Food Pantry, reportedly their biggest ever one-time donation. HMF is hoping to beat that record at the April 3, 2016, Middletown event. The 2016 HMF Can drive will be kicked off on Friday, February 26 from 3:00-6:00 pm, and Saturday, February 27 from 9:00 am-noon during the HMF Apparel Warehouse Sale at 41 Sequin Drive in Glastonbury. Everyone that brings 3+ pounds of non-perishable food to donate will receive a free HMF race shirt (while supplies last). In addition to hosting HMF Can drives, HMF also donates food leftover from race events to local groups. The Eversource Hartford Marathon, HMF’s largest event with approximately 14,000 participants in 2015, produced a total donation of 4,129 pounds, from apples and bagels to loaves of bread and bananas. Recipients included Open Hearth, South Park Inn and Food Share. The Foundation is committed to sustainability efforts and proactively seeks opportunities to donate, reuse or repurpose as part of post-event operations. Approximately 460 pounds in compost materials and 6,360 pounds of recycling were produced at the Eversource Hartford Marathon. Clothing donations from the event totaled 1,700 pounds. Donate Life CT supported the effort, with volunteers stuffing 35 bags of discarded sweatshirts, hats, gloves and other layers shed by race participants along the race course. Donations went to local shelters and charities. Another 440 pounds of clothing was donated from the HMF Warehouse to Goodwill to be distributed to 14 store locations across Connecticut. For more information on the HMF Can initiative or to register for 2016 events, please visit www.hartfordmarathon.com.